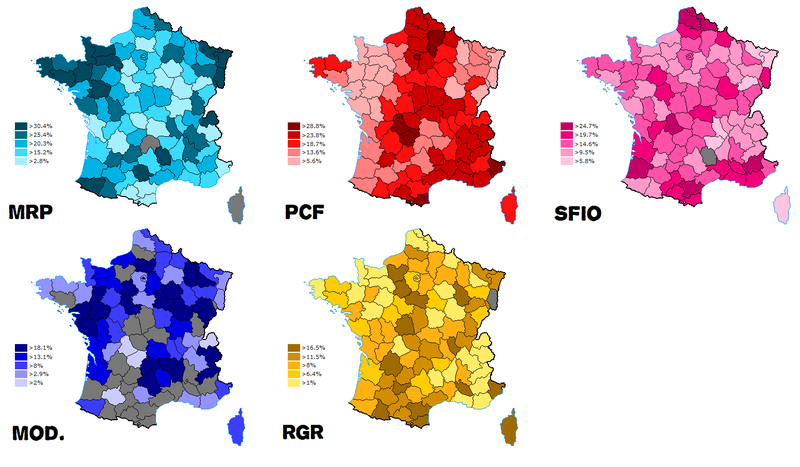 About a month ago, I had explored the political map of France following the June 1951 legislative elections. The 1951 elections had been marked by the emergence of the Gaullist RPF, which won around 22% of the vote and seriously disturbed the rather solid party system which had been established since 1945. As such, the 1951 elections do not really offer us with a “classic” view of the Fourth Republic’s main parties (the PCF, SFIO, MRP, moderates and Radicals) at their strongest or at least in a period where they were the only major political forces which weighed something at a national level. By 1951, the PCF’s decline had already begun, the SFIO was very much below its 1945 level and the MRP was in collapse. It is thus interesting to look at the political map of France in the elections to the Second Constituent Assembly of the GPRF in June 1946. They provide us with a view of the PCF and MRP at some type of ‘equilibrium’, while the SFIO, moderates and Radicals remained fairly strong as third parties. In the history of constituent assemblies around the world, it is fairly rare for there to be two successive constituent assemblies. Usually one constituent body is elected, drafts a constitution which is approved and the constituent body dissolved shortly thereafter to make way for the new regime’s elected legislature. As France wrote a new constitution following Liberation, however, the first constituent assembly ultimately failed to see its constitutional project approved, which meant that a second constituent assembly needed to be elected to start again. The constituent assembly elected in October 1945 shortly after the end of the war was heavily dominated by the left, with the PCF as the largest party with 27% of the seats and the SFIO as the third largest party with 25% of the seats. The PCF’s goal by this point was not to take power unilaterally on its own. Thus had been its strategy in 1944, but it had rather quickly changed its strategy as the war ended as it was not in Moscow’s interest to have the PCF creating a revolutionary situation in western Europe, which would have compelled the Americans to intervene militarily in France and disturb the new European balance of power. Instead, in 1945, the PCF’s objective was to work within the regime. Whether or not its final goal was still the establishment of a single-party communist state is up for debate, but in 1945, Maurice Thorez understood that the PCF was not in a situation to do so. Instead, the PCF had decided to work within the regime and participate in the governing coalitions of the provisional government – even with right-wingers and centre-right parties such as the MRP. What took form was the tripartisme, a coalition of the PCF, SFIO and MRP with ephemeral participation from the Radicals or moderates depending on the government. Tripartisme actually took form in January 1946 following de Gaulle’s resignation, but it had more or less operated – though with de Gaulle as the symbolic leader – since 1945. Though the PCF and MRP were both coalition partners, in terms of constitutional debate, the first constituent assembly’s debates were dominated by the left – PCF and SFIO – who held an absolute majority and whose constitutional vision was rather similar. The left worked over the MRP’s head (though the SFIO had wished to be more conciliatory with the MRP) and the result was the passage of a first constitutional project in the spring of 1946 which appeared to be the project of the PCF. The marking elements of the April 1946 project was unicameralism and the dominance of the legislative over the executive (and even judiciary). There was to be a single legislature, which would have control over the executive. The head of government would be elected by the National Assembly, who would then vote confidence in the winner’s cabinet. The President, elected by the National Assembly, would see his role limited to being a “mailman” who would inform the National Assembly of the candidates for head of government. Unicameralism and the legislative’s dominance over the executive was quite conform to the PCF (and SFIO) conceptions of what the new state should be. The old Senate of the Third Republic, which had overthrown the Popular Front in 1937 and had been a conservative bulwark, was despised by the left which saw it as a conservative, undemocratic aberration. They were also hostile to any strong presidential office which could have provided Charles de Gaulle or a person of his stature which tremendous power. For those who believe that the PCF had never abandoned its goal of taking power in France, the April 1946 draft was the democratic constitution which would perhaps have provided the easiest route to Marxist takeover. A potential “Marxist” (PCF-SFIO) majority in the National Assembly could have overpowered the presidency and judiciary and form a government according to its own wishes, with no conservative unelected upper house to counterbalance the hegemonic legislature. The April 1946 draft was approved by a 309 to 249 vote, with votes in favour likely coming heavily from the PCF-SFIO majority (305 seats) with the centre and right – especially the Radicals and MRP – opposed. The draft was submitted to a referendum on May 5. While the project had been the joint creation of the PCF and SFIO, during the referendum’s campaign, the SFIO kind of erased itself which made the PCF the dominant force of the ‘yes’ campaign. Those who know only one thing about the April 1946 draft will probably know that it was “the communist project” which is not technically true, but became more or less accurate given that the ‘yes’ campaign was basically a PCF campaign. The right opposed the new constitution and de Gaulle had shown that he was hardly pleased with the result (by this time, de Gaulle was no longer head of the government), but the ‘no’ campaign was largely spearheaded by the MRP. de Gaulle had not even bothered to vote in the end. The result of the May 5 referendum came as a major surprise: 53% no, 47% yes with 19% abstention. The mood seemed to have been that the draft would be approved by the voters fairly easily, but a fairly strong anti-communist reaction rejected it and forced all parties to return to the drawing board. The results of the May 1946 referendum will be worth exploring in further detail someday, as it really laid down the map of French left and right until the mid-1980s at the least. A second constituent assembly, with seven months to draw up a new constitution, was elected on June 2. By and large, voters voted as they had in October. The PCF won 25.98% of the vote, against 26.23% in October. The MRP, with 28.2%, outpaced the PCF and gained considerably from the 23.9% it had won in October. The SFIO, with 21%, fell back from the 23.5% it had won in October. The right, with 12.8%, fell from 15.7% in October. The RGR (Radicals and UDSR) won 11.6%, close to the 10.5% they had won in 1945. The PCF won 153 seats (159 in 1945), the SFIO only 128 (146 in 1945) while the MRP won 166 seats, up from 150. The right-wing ‘moderate’ constellation added up to 67 seats, actually up from 64 in 1945 (note that 11 parti paysan deputies in 1945 caucused with the UDSR in 1945, but the 9 remaining caucused with the RI group in 1946). The Radicals and UDSR, weighing 60 seats in 1945, weighed 52 in the new legislature. The bulk of voters actually voted as they had a few months before, but the shift of only a few voters meant that the new constituent assembly no longer had a left-wing majority of Communists and Socialists. The MRP had become the largest party, and it could no longer be ignored in drafting a new constitution. Fairly quickly, a compromise acceptable (more or less) to the PCF, SFIO and MRP was worked out which was approved by 53.5% of voters in a referendum on October 13, 1946. The referendum was a Pyrrhic victory for the new Fourth Republic, given that, as de Gaulle styled it, a third of voters didn’t vote (a very high figure for the time), a third approved it and a third rejected it. But it had been approved, despite Gaullist opposition and initial Communist reticence. The MRP’s objections to the April draft had actually been fairly minor in the wider realm of things and mostly concerned the number of chambers and executive powers. The new draft created an indirectly elected upper house, similar to the old Senate (the upper house would also participate in the president’s election), and slightly increased the President’s powers, notably giving him the right to nominate a head of government instead of being relegated to the role of mailman. It is worthwhile to stop for a bit on the June 1946 elections, despite their limited significance in the wider realm of things. They were the only elections in which the MRP outpolled the PCF for first place, and they provide us with a nice view of the two parties at some sort of equilibrium. For me, the main interest lies in having a snapshot of French politics in that ephemeral period of the post-war era where the Gaullists or other anti-system forces of the right (Poujadists) were absent. As just about any other election, June 1946 is also a good excuse to make comments about the MRP’s weaknesses, the PCF’s ever-fascinating electoral coalition or talk about random things which are quite interesting. Once again it is worth pointing out that while these were proportional elections (highest averages method), in some departments, particularly ones with few seats, the results might not be reflective of the ‘real’ political culture but might instead be heavily conditioned by circumstances or factors such as local candidates, party lists and alliances or party organization. I think you can develop an analysis from this map, and there are clear – and familiar – patterns which are already perceptible. But I shy away from limiting an analysis to the departmental level, as departments – as the bulk of sub-national divisions around the world – are not homogeneous entities and often contain a variety of different regional realities. The following map, built on the same bases as the map which you can see in my 1951 analysis, displays results at a cantonal level. The base map is mine, but the work of colouring in this beautiful map was done by a friend of mine who was kind enough to allow me to use it for this blog’s purpose. The Christian democratic Popular Republican Movement (MRP) was founded in 1944 by a group of Christian left résistants whose political goal was to create a broad movement which provided a middle-ground between the economic liberalism of the right and the Marxist collectivism/socialism of the left. As such, the MRP’s platform was actually pretty left-wing, notably so on economic issues where the MRP was quite wary of laissez-faire economic liberalism. It was in a sense very much linked to the teachings of social Catholicism, which had emerged in the early twentieth century. In the political history of French Catholicism to date, the MRP represented a novelty. In the past, Catholicism in France – which meant actual Catholics who went to church and not secular ‘Catholics by tradition’ – was closely linked to the right. The Catholic Church had been associated with the forces of reaction of the Ancien Régime and republican propaganda up till the turn of the century clearly identified the Catholic Church as the enemy of progress and Catholicism as running counter to the republican/revolutionary ideals of democracy, freedom, liberty, equality and progress. The Catholic Church in practice also acted as the enemy of the nascent republican state, and on the ground the clergy formed a powerful political actor often working in tandem with the old landed aristocracy or bourgeoisie. In places such as Anjou or Vendée, the clergy allied with the landed rural aristocracy ran the show. Was it a coincidence, therefore, that those regions marked by the revolution’s egalitarian traditions bred by small private property were the most anti-clerical and de-Christianized regions of France? The MRP was unique in that it was the first political party identified with political Catholicism which tried to find a common ground between Catholic faith and democracy, liberty and social progress. However, the MRP was unable to conciliate the two and its weight as a political actor weakened seriously following 1946, in large part because of the emergence of Gaullism. Following the 1950s, the non-Gaullist centrist tradition embodied by the MRP and later parties would be worth only 15% of the French electorate at most. Why was the MRP unable to maintain its electoral coalition of 1946? Firstly, and most importantly, the traditional right of the Third Republic – basically the old conservative FR and the centre-right AD – were in shambles, were archaic parties and were totally discredited following the end of the war. The FR and AD had been partis de notables by excellence, to which the Third Republic’s electoral system – the single-member scrutin d’arrondissement – had been quite conducive to. Given that the parliamentarian’s survival depended on voters in his local constituency, when he voted he did so based far more on his constituency’s interests than in the interests of his weak party. After all, the party could not elect him, so they could not defeat him. However, the party-list proportional representation of the post-war era constructed a whole new system were the autonomy of the individual member was very restricted by the growing power of the party apparatus. They were now the ones who decided whether he would be elected, meaning that the parliamentarian’s interest was now to look out for his party who had the power to decide of his future. The parties of the Third Republic had been weak, unstructured, lacking authority over its members and often – especially on the right – consisting only of a myriad of “committees” for which the era was quite famous for. On the other hand, the parties of the Fourth Republic were generally strong, structured, cohesive and hegemonic. The left, especially the PCF, had already been structured in the later years of the Third Republic, but the MRP understood the importance of structure following its foundation. The right never did understand that. Until the creation of the CNI in 1949 which structured matters a bit more, the French right was very much divided between weak and irrelevant parties and groups. The largest was the Republican Party of Liberty (PRL), whose name, in the tradition of the French right, highlighted what it was not. In the second constituent assembly, however, the PRL had only 35 members against 23 members for the ‘Independent Republicans’ group – a coalition of those people such as former FR deputy Édouard Frédéric-Dupont who did not join the PRL. Alongside the RI group, there were 9 members of the small conservative agrarian Parti paysan led by Haute-Loire deputy Paul Antier. It also did not help matters that the right of the Third Republic had been closely associated with the ‘defeat’ (in 1940) and then had its reputation severely tarnished by the collaboration of several of its prominent members with the Vichy regime. Following the war, the electorate as a whole embraced parties which maintained a clean reputation (more or less) or had been closely identified with the resistance (such as the PCF post-1941). Politicians who had collaborated were either legally barred from participating in politics (for a short while) or were shunned by voters. The bulk of the “moderate” tradition found itself discredited by the defeat of 1940 and the subsequent collaboration or at least a pro-Pétain vote on July 10, 1940 of the bulk of its members. For voters, the old right was a discredited and archaic structure. For up-and-coming right-wing politicians or those old right-wing politicians in search of a new beginning, there was little incentive to join the right. The MRP, established in 1945 as the credible party of the right or at least the largest non-Marxist party, had much more appeal. Some bad tongues have called the MRP the Machine à Recycler les Pétainistes, perhaps not without reason but still a rather unfair abbreviation. If you’re in the business of making fun of party abbreviations, Mon Révérend Père would fit the MRP better, especially if you’re secular or left-wing. The second reason, more contextual, lays in the MRP’s successful campaign against the April constitution in the May 5 referendum. The no campaign had been waged almost entirely by the MRP (and the yes campaign almost entirely by the PCF), so for anti-communist and right-wing voters in June, the MRP appeared, pragmatically, as the most viable anti-communist option. Thereby emerged the contradiction between a right-wing electorate and a left-leaning platform and party leadership, a contradiction worsened by the fact that until 1951 the MRP almost always governed with the Socialists. The old line is that the MRP was a centrist party with a right-wing electorate which governed on the left. The MRP was never able to overcome this fundamental existential contradiction. The map shows this problem quite clearly. The MRP was clearly dominant in the bulk of la France catholique, that is to say most of Brittany, the inner west, the Bocage Normand, the inner west, the Basque Country, the southern Massif Central (the plateaus such as the Aubrac, the Grands Causses, the Cantal and so forth), the Moyen and Haut Vivarais (Ardèche), the Loire and Rhône departments, Savoie, the Massif du Jura (the region around Pontarlier and Saint-Claude), most of Alsace-Moselle, parts of Lorraine and Flanders. While those regions remain the main bases of the French centre to this day despite the major demographic evolutions they have gone through since the 1940s, in the 1940s these regions were largely rural and very conservative. Regions such as the inner west and continental Brittany had been the monarchist strongholds up until the point where the monarchy became a lost cause (1890s) and remained solidly conservative and clerical. I bet that all things being equal, if faced by a party with the MRP’s platform and a (similarly strong and not discredited) party with a traditional conservative platform in 1946, the bulk of these regions would have gone for the latter. In the west, the MRP dominated places such as the Léon, Vannetais, Brocéliande, Vitréen, the Bocage Angevin, the Choletais and the Bocage Vendéen around Montaigu which were all some of the most clerical but also most reactionary places at the turn of the century (the Léon was slightly less reactionary than its voting would indicate, though). Of course some of it can likely be laid on local circumstances, for example in Vendée, the MRP’s top candidate Lionel de Tinguy was from the Haut-Bocage (canton of Pouzauges), while the standard-bearer of the right, Armand de Baudry d’Asson was from Challans, a city near the Marais Breton and the coastal and less clerical region of the Sables-d’Olonne. But the first impression is quite striking: the MRP dominated in the bulk of the inner west’s most conservative areas. Outside the west, the MRP also did well in the other parts of the Catholic mosaic of France. Alsace, joined by Moselle, was an MRP stronghold complemented by a strong MRP machine at a local level. The MRP won all Alsatian cantons by wide margins save for the Protestant cantons of Bouxwiller and Drulingen which voted RGR. Flanders and some of the more religious rural areas of the Calaisis, Artois and Boulonnais also voted pretty solidly MRP. The MRP’s success was not as pronounced – far from it in some cases – in the Basque Country, Aveyron, Cantal, Haute-Loire or Ardèche but this largely lies in local dynamics of partisan politics whereby the traditional right was better maintained and ate up the bulk of the clerical conservative vote, especially in the Ardèche where the clergy never solidly backed the MRP and where Paul Ribeyre managed to reorganize the local right. At the same time, the MRP vote expanded successfully into conservative but secular regions such as the Marne, Ardennes, Vienne and parts of Lower Normandy. A similar phenomenon might have been at work in the Parisian basin. A clear sign of a ‘strategic’ right-wing vote for the MRP, as the dominant anti-communist force, but a weak vote which would quickly abandon the MRP in favour of Gaullism, more in touch with the political culture of those regions. In my post about the 1951 election, I had focused the first part of my analysis on the PCF vote. Of course, as in 1951, the 1946 map of the PCF vote – obviously very close to that of the May referendum – replicates the C/G shape which became the basis of the French electoral map (in the south) until the mid-1980s. The C connects the Italian border to the Catalan border following the Mediterranean coast, but is disconnected a bit in the southwest before forming a solid bloc composed of the Agenois, Limousin, Berry, Bourbonnais and Nivernais. In the north, the Communist vote was concentrated in the Parisian basin and a bloc composed of Picardie and the mining basin of the Nord-Pas-de-Calais. The northern strongholds are the ones which we have the least difficulty explaining: unionized, working-class and largely industrial. I had examined the PCF’s C in southern France through pretty Marxist class-based analysis last time, and true enough there are a handful of small industrial centers (most often they formed the PCF bases) and rural areas with a poorer peasantry, often working the land through sharecropping (such as in the Bourbonnais and Berry). But I recognize that this analysis cannot explain everything, and there are exceptions to every pattern and other patterns which this Marxist analysis cannot really explain. There is a cultural factor at work here, where the PCF vote is much less a revolutionary and ideological ‘class vote’ (vote de classe ouvrière) as it may be in the Nord or Seine, but is much more a protest vote. This protest vote is not for the PCF as a communist party, as the party of Moscow or the Marxist party; but rather a protest vote bred by dissatisfaction, poverty, isolation and a good dose of anti-parliamentarianism. A good number of observers have noted that the PCF’s electorate was not all ideologically Marxist – far from it! This type of protest vote developed in rural areas with a strong left-wing republican and anti-clerical tradition, which has cycled through the Radicals in the late nineteenth century, the SFIO at the turn of the century and then the PCF in the post-war era. To break out of its urban strongholds built up following the Tours Congress, the PCF needed to resolve a contradiction between Moscow’s doctrine and the political reality of France. Soviet doctrine was agrarian collectivism and breaking up (large) private property, a doctrine which might make sense in Russia, southern Spain or Cuba but which doesn’t make sense in France. Private property in France is a tradition inherited from the Revolution of 1789 which gave land to the peasants, providing him with property and a way of living. By consequence, private property was a revolutionary ideal whose defense as the basis of the Revolution has always been defended by the left. The PCF’s agrarian doctrine (until 1964) included defense of private property mixed in with references to collectivization of land, all styled under the ambiguous slogans of la terre aux paysans or la terre à ceux qui la travaillent. Gradually, the PCF would evolve towards defense of private property (mixed in with rural electrification and development) and limit calls for agrarian reform to expropriation “large capitalist property” which made use of wage labour. The PCF’s evolution towards a defense of private property, which amounted to the appropriation by the PCF of the old Radical platform, was due in large part to the work of Renaud Jean, the tribun des paysans and interwar PCF deputy for the Lot-et-Garonne. Criticized by Trotsky and the PCF’s left, Renaud Jean was the representative of private property within the PCF and responsible in large part for the development of the PCF’s agrarian platform which allowed it to appeal to impoverished peasants in central and southern France. As a powerful eloquent representative of his department’s small wheat producers, winemakers or tobacco growers, Renaud Jean strongly implanted the PCF in his department. But he was also one of those little-known PCF ‘rural barons’ alongside the likes of Marius Vazeilles (Corrèze) who played a large role in strengthening the PCF at a rural level. In 1946, the SFIO began its slow and painful decline which would end in the creation of the PS on the ruins of the SFIO. The SFIO had been dealt a severe blow in 1945 when it was outpaced (26-24%) by the PCF, despite Socialist leaders in this pre-polling era being pretty confident of their ability to remain as the dominant driving force of the left. While the SFIO no longer had the prestige of being the driving force of the left, after 1947 the SFIO would have the ‘prestige’ of being a key part of most governments and as such playing the role of the “responsible” party of the left against an increasingly Stalinist and revolutionary PCF. But the SFIO would be weakened electorally, starting as early as June 1946, by the contradictions between the SFIO’s revolutionary or radical Marxist rhetoric (especially after Guy Mollet’s left-wing faction defeated the right-wing Blum/Mayer faction) and the realities of governing which includes compromise, concessions and dealing with the right. At 21%, the SFIO was still a pretty important actor, but it had largely lost the working-class vote outside the Nord and maybe Limoges. The SFIO vote during this period was socially composite – an inter-class electorate – and made up of a bunch of different demographics. There was a rump of perhaps more affluent and less revolutionary working-class support, mostly in the Nord (Roubaix, Pont-à-Marcq, Avesnes-sur-Helpe, Cambrai), parts of the Pas-de-Calais mining basin, Saint-Nazaire and Limoges. 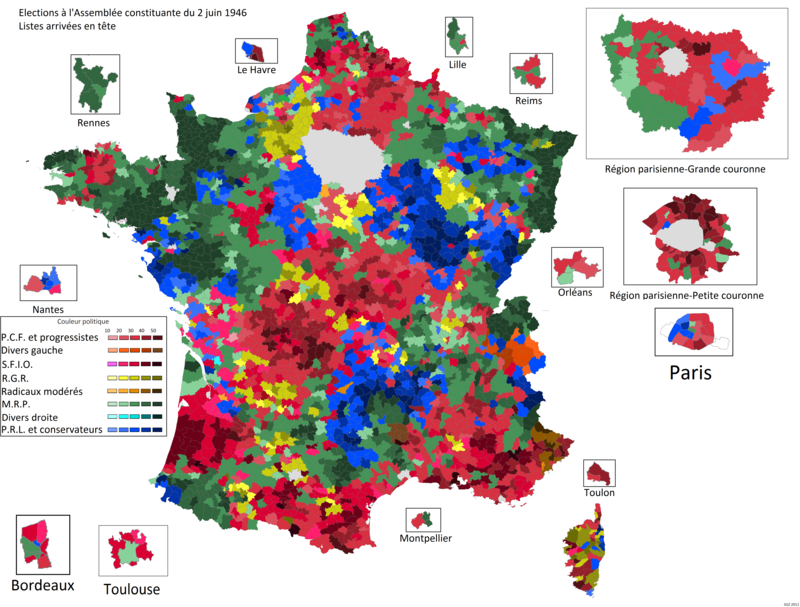 There was a strong element of old republican, left-wing and anti-clerical rural support in the southwest (Haute-Garonne, Aude, Ariège, Landes), Provence and other similar areas such as the Tregorrois/Monts-d’Arée or eastern Sarthe (Plateau Calaisien). These are mostly regions of small private property, save the Landes which was hugely dominated by sharecropping and agriculture influenced by resin extraction from the Landes’ vast pine forests. It has been described as an electorate made up in good number of middle-class salaried employees and public sector workers. The June 1946 election was not very significant, but in purely electoral terms it saw a balanced field between the MRP and PCF and was the penultimate election before the emergence of anti-system forces in 1951. Posted on January 22, 2012, in GPRF (1945-1946), Left (PS, PRG, PCF, Greens, DVG etc), Right (UMP, RPR, UDF, DL, MPF, DVD etc). Bookmark the permalink. 3 Comments. Just seen this. Must read it when I’ve got time more time. Great, great work. Marvelous cantonal map. I was longing for an analysis of one of these early 4th Republic “clean” elections, before the political landscape turned into a big mess. The analysis of voting pattern is very instructive and thorough as usual, and made me understand better the nature of each party’s electorate. The maps are also fascinating. Put it shortly, it’s great and I really hope to see more of these election-by-election analyses in the future (what next ? 1962 ? 1978 ? 1981 ? 1997 ? 2007 ? ).